It sounds like something out of an Agatha Christie novel, but the Case of the Codex Calixtinus is all too real. 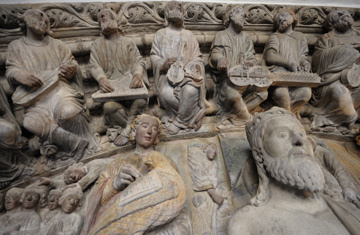 On Thursday, July 7, church authorities in the Spanish town of Santiago de Compostela publicly confirmed that the priceless 12th century manuscript had been stolen from a safe in the cathedral vault. According to the local press, when the theft was discovered, the keys to the safe were still hanging in the lock. The illuminated Codex was apparently removed from the cathedral archives on July 5 and reported missing to police the following day. At a press conference on Thursday, the cathedral deacon, José María Díaz, said that only he and two other archivists had access to the manuscript and that one of them had last seen the document on June 30 or July 1. Although the Codex was taken without signs of forced entry, Díaz said, "We have been victims of a terrible attack." Written in the mid-1100s under the auspices of Pope Calixtus II, the Codex is about the apostle St. James, whose remains are believed to have miraculously washed up on the coast of northwestern Spain. The town that houses his tomb, which became known as Santiago de Compostela (Santiago means "St. James" in Spanish), was transformed in the Middle Ages into a major pilgrimage site  the third most important, after Jerusalem and Rome  for Christians from all over Europe. Indeed, book five of the Codex is a sort of a Michelin guide to Santiago, helpfully instructing pilgrims on the best routes to take and the poisonous rivers to avoid. "It is one of the most important texts of the Middle Ages and of incalculable value," says Jesus Tanco, a St. James expert at the University of Navarra. Security at the cathedral was perhaps not as tight as it should have been. According to reports, none of the cameras in the archive were trained on the vault where the manuscript was kept, and although access to the document was strictly controlled, access to the chamber's keys was not. "The church likes to operate under a principle of good faith," says Tanco, who is also president of the Navarra chapter of the Friends of St. James Pilgrimage. "We've been recommending for years that they improve their security measures." The Spanish national police are currently investigating the case. "At this point, 24 hours into the case, there are all kinds of possibilities," says a police spokesman. "It could be anything from someone who doesn't realize what he has to a professional thief who was commissioned by an individual collector." Richard Oram, a member of the Rare Books and Manuscript Security Committee for the Chicago-based Association of College and Research Libraries, sees the latter explanation as likelier. "Any expert, or even someone with basic knowledge, would be able to instantly identify [the Codex] and know that it was stolen," he says. "So it would be impossible to sell." Oram is an assistant director of the University of Texas at Austin's Harry Ransom Center, one of the largest collections of rare books and manuscripts in the U.S.  and itself the target of a major theft in the 1990s, when a library volunteer stole 300 volumes, including a 16th century collection of sonnets by Italian humanist Francesco Petracha. The lessons Oram learned from that experience, coupled with the unforced entry into the Santiago safe, lead him to believe that the Codex theft was probably an inside job. "The general rule of thumb is that 60% or 70% of library thefts are by patrons," he says. "But the dollar value of the thefts tilts disproportionately toward employees." Whatever the origins of the theft, the Codex is no stranger to unscrupulous behavior. Amid its descriptions of Basques with terrible table manners and Gascon ferrymen who overload their own boats in order to steal their drowned passengers' goods, the document takes a dim view of the lands along the pilgrimage route  one perhaps shared today by Santiago church officials. Those places are home, the author writes, to "bad and vicious men."